A group researchers from NAST Centre, led by P. Morales (ENEA Casaccia) and R. Senesi (University of Rome Tor Vergata) in collaboration with IRCCS Neuromed, Pozzilli, Italy, have successfully fabricated and tested elementary bidimensional circuitry made of single-wall carbon-nanotube–based conductors, self-grafted on different polymer films, for electrocorticograms in an attempt to develop a simple technology for flexible and stretchable electronic devices. Unlike in other studies of polymer-carbon nanotube composites, no chemical functionalization of single-wall carbon nanotubes is necessary for stable grafting onto several polymeric surfaces, suggesting viable and cheap fabrication technologies for stretchable microdevices. As a first example of technological application, the electrical functionality of a carbon nanotube– based 6-sensor (electrode) grid was demonstrated by recording of subdural electrocorticograms in freely moving rats over approximately three months. The results are very promising and may serve as a basis for future work targeting clinical applications. Fig. 1. 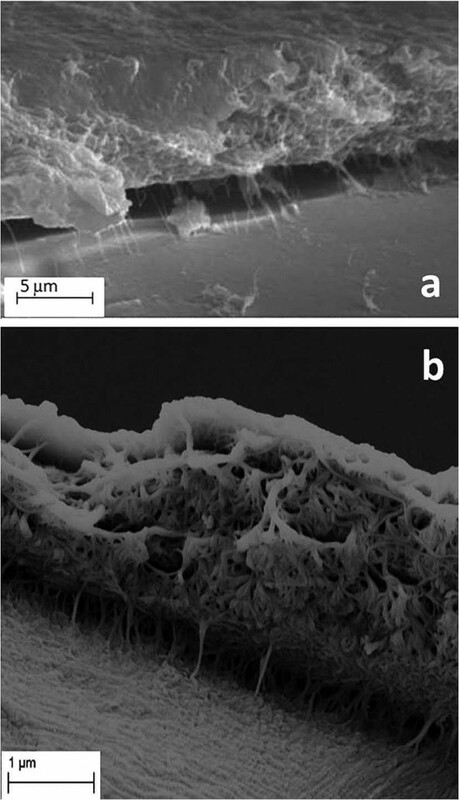 SEM images of SWCNT layers on MD-PE at different angles show many nanotube bundles firmly bonding the conductive layer to the polymer surface. 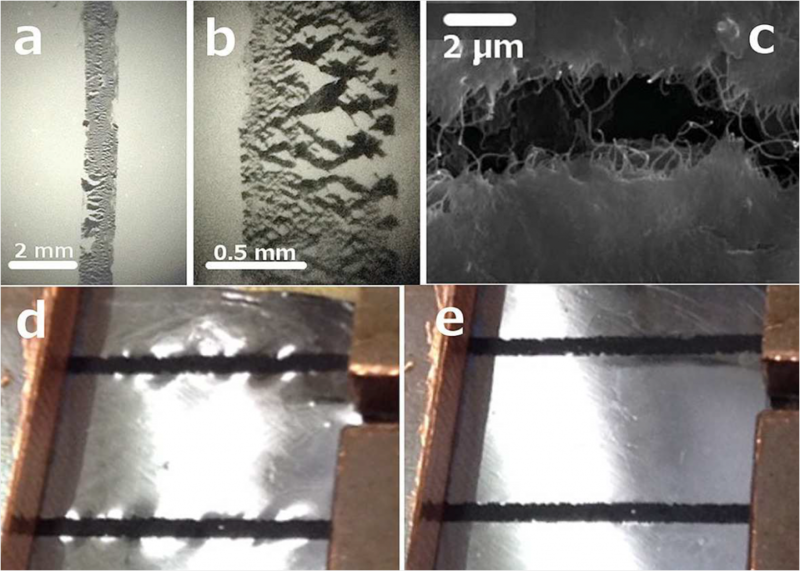 Panel (a) shows strained nanotubes on attempting detachment of the SWCNT layer from the polymer (note that some nanotubes are broken due to high tension). Panel (b) is taken, on a different specimen, at a very low angle, nearly parallel to the surface at the edge of the SWCNT layer and shows the large amount of binding nanotubes well rooted into the polymer. Both images were recorded after a few sticky tape strippings. Fig. 2. Characterization of stretched SWCNT wire grafted on MD-PE. Panels (a) and (b): Severe stretching. Doubling the length of the polymer substrate produces a bellows like structure, as shown in (a), (b), that is still conductive. Panel (c): The SEM image also shows single SWCNT bundles bridging the majority of the cracks that form the extended bellows. Panel (d): The unstretched, suspended polymer film shows wrinkling due to SWCNT grafting, which disappears on slight stretching (e).